Lot Size: 9000sq. ft. 75ft x 120ft "Rectangular"
Welcome to 227 Queen Street! 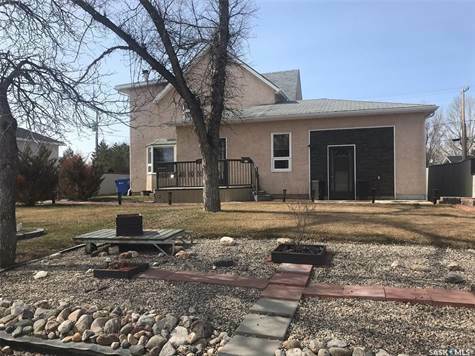 This 2 bedroom home has 2 bathrooms and has been extensively renovated! In 2009, the furnace, electrical, water heater, C/VAC, sump pumps, weeping tile, shingles, windows and doors were all replaced! The home has stucco and 1-inch insulation, plus 2 layers of Tyvac after the Energuide Report was completed. The basement has seen a lot of work and has the potential for a 3rd bedroom addition. Enjoy drinks on the deck or watch the kids play in the fenced backyard! The 30x30 garage includes radiant heating and boasts 220V service – perfect for the mechanic in the family! The greenhouse is connected to the garage convenient to the garden space. All appliances are included, most furnishings are negotiable. Milestone is an easy drive from Regina and Weyburn and has the amenities plus schools of a thriving community!